The Clackamas River in Oregon. The Clackamas river originates in the Cascade mountains and drains out into the Willamette river. Approximately 83 miles in length the Clackamas river in one of the longest rivers in the State of Oregon. The Clackamas is also one of the few rivers in Oregon’s that offers up year round Salmon and Steelhead fishing opportunities with winter and summer run steelhead, spring and winter run Chinook and summer and winter run Coho. 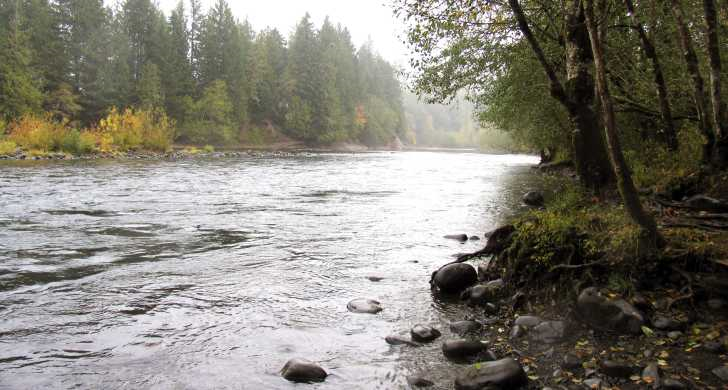 The Clackamas river is very accessible to anglers offering several public fishing access points throughout the Clackamas river system. To view Clackamas river fishing access locations see our Clackamas river fishing access maps below. Hatchery Salmon and Steelhead angling is generally year round but some areas may have early closures for specific species. always be sure to be up to date on the regulation to ensure you’re not violating the law. **See Oregon State Department of Fish and Wildlife REGS for exact times. This fishery generally allows 2 adult salmon or steelhead per day and up to 5 jacks. **See Oregon State Department of Fish and Wildlife REGS for details. There are several types of effective tackle that can be used on the Clackamas river. Barbless Hooks are required, plunking with bait like sand shrimp, Salmon eggs or bait fish can be effective. Also Spinners in variety of colors work as well. Lime Green, Pinks and Orange colors seem to work well, also fly’s or corky and yarn can produce nice results. Shrimp, Salmon Egg, Herring or other bait fish. Hand to Hand. Eye protection recommended in the hot spots!